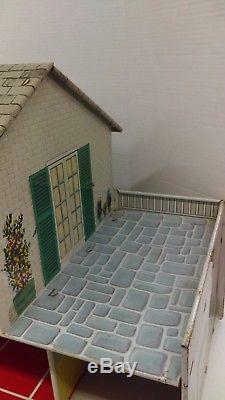 Marx 1950's Tin Litho Metal Colonial Mansion 2-Story Doll House & Sunroom Giant. 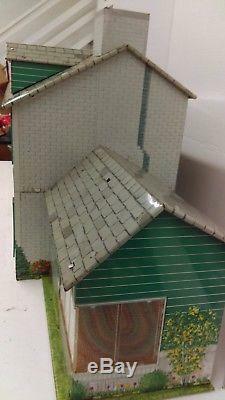 Up for sale, I have a vintage 1950's Marx, tin 2-Story Colonial Mansion Doll House. I believe this is one of the largest Marx doll houses produced. The house has a unique attached sunroom or season room and it measures 44 1/2" L x 19"H x 12D. The house is in very good condition with some scratches and light denting to some of the tin, but I believe for the size it is in great condition. It appears that the awning that hung over the front door is missing, and the little coupla that was on the roof of the sunroom is missing. All shutters, door and separating tin walls are intact. So please know these two items you would need to reassemble. 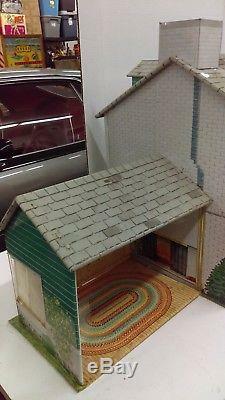 This is a very hard to find large Marx tin house. Please look at the pictures and judge it for yourself. DO NOT DUPLICATE OR COPY! 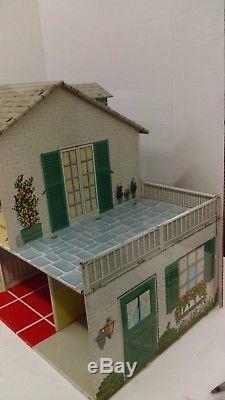 The item "Marx 1950's Tin Litho Metal Colonial Mansion 2-Story Doll House & Sunroom Giant" is in sale since Sunday, November 05, 2017. This item is in the category "Dolls & Bears\Dollhouse Miniatures\Doll Houses". The seller is "timelinecollectibles" and is located in Caledonia, Wisconsin. This item can be shipped worldwide.